This simple, vernacular commercial brick structure was built for Alfred Bossi, a nephew of the noted Bossi family which built many of he structures in Market Square. It replaced a wood structure on the site and was intended to house the A. Bossi and C. Giesselmann grocery (also licensed to sell liquor). The building has a handsome corbelled brick cornice and originally had cast iron pilasters on the ground floor and a wooden arcade along both street frontages. The brick has been painted, obscuring the original signage. Additions were made to the store in 1885 ($2,000) and a one-storey addition in January 1888 ($1,500). By 1892, the building housed the Mirror Saloon and A. J. Rowbotham, grocer. In 1907, it was the premises of C. H. Tite and Co., painters and C. W. Blackstock and Co. real estate, financial and loan agents. When Blackstock moved to Fort Street the the following year, his former space was occupied by John Ringshaw’s delicatessen. His new neighbor was Direct Importing Tea and Coffee. 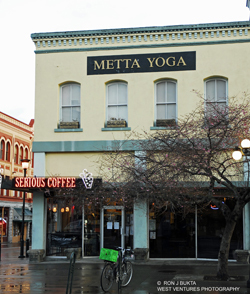 The building was repainted to highlight its architectural detailing and in 2009 was the home of a coffee shop.